Time so share my secret Artform 3D polishes. I got four of these polishes last week and I am very happy with them. I got Red, Mauve (actually purple), Dark Blue (more like aqua blue) and Gold (I'd call it platnium). 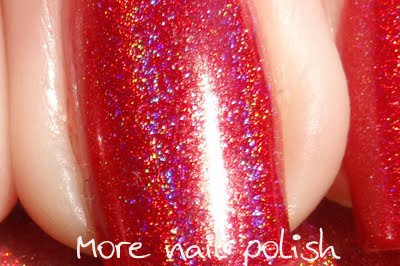 This one is the Red 3D polish. These dry to a high gloss finish with a beautiful strong scattered holographic effect. The holo effect on this is similar to the China Glaze Kaliedescope collection. Sorry about the tip wear in this photo, it was taken at the end of day two. This was two coats. 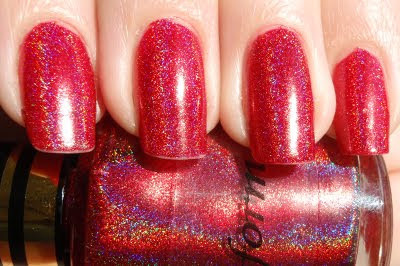 Here is a close up of the holo effect on this polish. The only down side was that they take a while to dry. Even with Seche Vite I found I had to wait to ensure I didn't get bumps and dents. This is unusal for a holo polish, as usually they dry really fast. So, where did it get these? I found them online from Artform Nails in Perth, WA. They only deliver to Australia, so sorry everyone overseas, but Aussie gals, YAY!! They have ten 3D colours and they are $10.95 for a 14.5ml bottle. I will post about the mauve (purple) one tomorrow. They also have a Aluminium Foil range for $3.25 bottle, a "Revolutionary Range" - which are all true duo chrome polishes for $10.95. I haven't tried any of them yet though. i've been wanting a red holo for some time. thanks for sharing this one! Absolutely stunning!